Hey, big news, everyone! 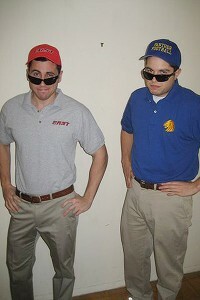 It’s time to announce the results of the First Annual Grantland Halloween Costume Contest. Thanks to the rabble-rousers, mischief-makers, and non-sluts of the world, who sent us photos and costume descriptions over the past few days. We enjoyed every one. Our daughter was born August 12th, 2011. Her name is Riley … She weighed 14lbs, 9oz. at 9 weeks, a little chunky thing. 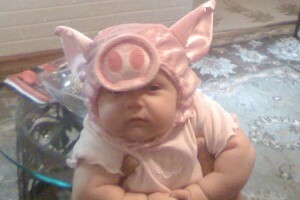 Is it mean that we dressed her as a little piggy? Are we bad parents? 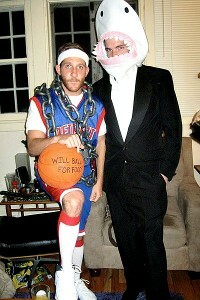 Attached you will find two pictures of my costume, the NBA lockout. Pretty self-explanatory. The irony of this costume is that putting on the uniform and carrying around a basketball really made me want to shoot some hoops but the chains were too cumbersome. I was literally locked out of playing basketball. You can consider the shark David Stern or Billy Hunter, depending on which side of half-court you fall on. Save the season! Two years ago when I was going to school in San Diego, I went as Adam Banks for Halloween. The best part (besides my cheezy hot pink 90s street hockey stick) was that I had my wrist taped up and padded. You know, to sell that cheap slash from the dirty Team Iceland. It’s the little things. My friends and I from graduate school (Notre Dame’s Mendoza College of Business) dressed up as the starting five from Hoosiers. 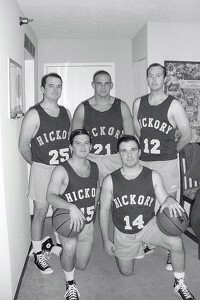 More specifically, we are the Hickory High School Huskies — 1952 Indiana State Basketball Champions. 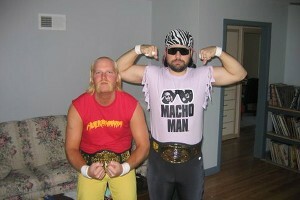 Here are some pictures of Hulk and Randy from Halloween. Hulk grew his hair out for about 7 months just for this costume. We had a few adult beverages and wrestled our asses off, Brother. 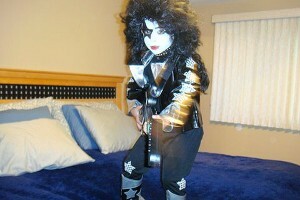 Just read the Halloween article from Bill Simmons and thought I’d pass this along. 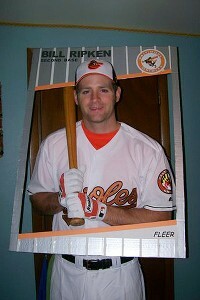 My buddy, Eric, and I were talking one day about awesome costume ideas and I threw out the possibility of dressing up as the infamous 1989 Fleer Bill Ripken card (the unedited original version, of course). He took that idea and ran with it and came up with what you see in the attachment. You can’t really make out the bottom of the bat in this picture, but trust me, the costume is complete. Easily my favorite costume ever. First of all, I really love the website, great job! 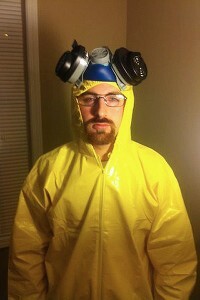 My roommate, Rob, dressed up as Walter White of Breaking Bad for Halloween and I think he deserves to win the Grantland costume contest. As you can see, Rob shares an uncanny resemblance to Mr. White, one that has made his job as an elementary school technology administrator quite difficult (the children are very scared of him). We are both big fans of the show and thought this would be the ultimate tribute. Side note: I was supposed to go as Jesse Pinkman, but decided Rob would outshine me and decided to go as the Hipster Cop. I’m such a great friend. 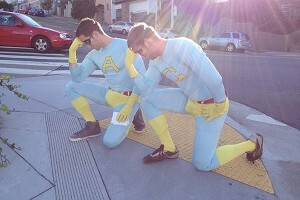 Anyway, hopefully you enjoy the costume and pick my dear friend as the winner. I hope the pictures are self-explanatory. 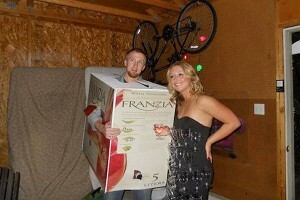 It’s a box of Franzia wine. It does have a fully functional bag placed in the appropriate position. My girlfriend went as, well we really aren’t sure what she is. We took about 50 plastic wine glasses and velcro’d them to her body in a black dress. I guess she was a black cabinet full of wine glasses. The process of making this box wasn’t too bad. It took about a full day of assembly. We took pictures of a normal box and had all the sides of the box blown up. I had purchased a few boxes in a large size but due to the overall size I had to tear down the box into 4 sides. We painted the box white, then glued each “side” back together with the pictures placed. Just the actual measuring, cutting, gluing, and painting was pretty time consuming. The worst part about the night was the fact that the party’s host had a kitchen the size of a bathroom. So it was one box of Franzia wine at a time going down the narrow kitchen walkway outside. It survived the first party earlier this week and I will be wearing it out again Saturday night. I doubt it’s going to make it to Monday. And even if you don’t use my kid’s pic – I love the idea of running an online contest, and I love the site – keep up the good work! So who won? We were too lazy to couldn’t decide, so we’re leaving it up to you. 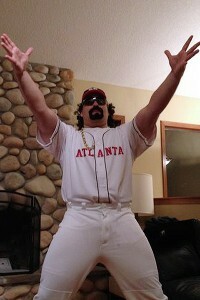 Pick the lucky winner of Grantland’s Costume Contest by voting on our Facebook page today. We’ll send that person a bag of Famous Amos cookies from the Official Grantland Snack Cabinet, as promised. Unless we’re out of Famous Amos. Then you get fruit snacks. Sorry, guy.